I am so close to being done, but unfortunately I just couldn’t finish Mr. Salvador in the last 3 weeks. I ran out of the light brown and didn’t get to the craft store until a few days ago because I was so busy with work and home responsibilities. So, here is where I was last time. Sorry for the bad photo. The rest of the piece is very light in color and a bit boring so I have struggled to make any more progress. 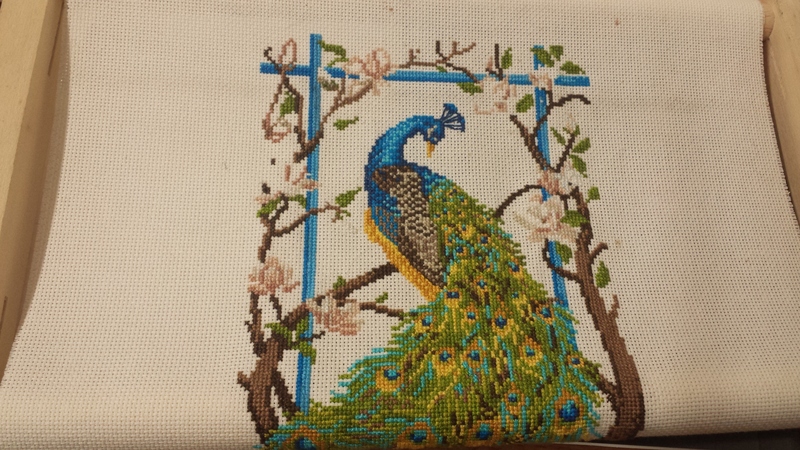 Hopefully you can see where I have been working on the flowers and branches. One thing I did get accomplished this week was framing my poppy project. The frame, mat, and glass were only $2.50 at the thrift store. It’s just sitting in the frame but at least it’s protected right? Please check out the other members of the group by clicking on the names below. You won’t be disappointed! 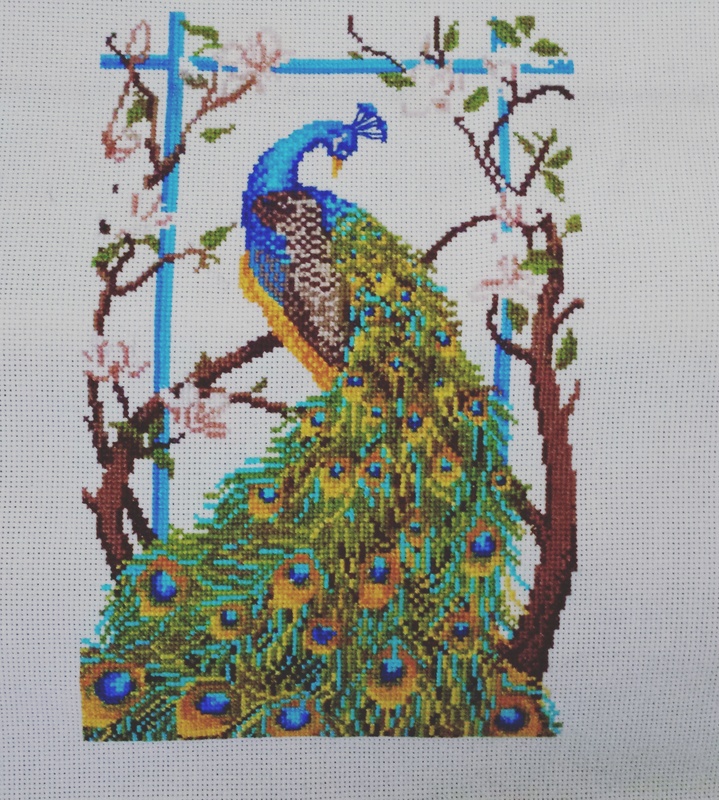 This entry was posted in cross-stitch, Cross-Stitching, Project Peacock, SAL, Uncategorized and tagged cross-stitch, Project Peacock by marymargaretripley. Bookmark the permalink. Mr. SAlvador is coming along though! I could see the work you have on the flowers even before you mentioned it, so it was definitely enough to catch me eye! He is beautiful. Can’t wait to see the finish. Wow. I can almost feel the feathers. Still love it. Even not quite done this is gorgeous. 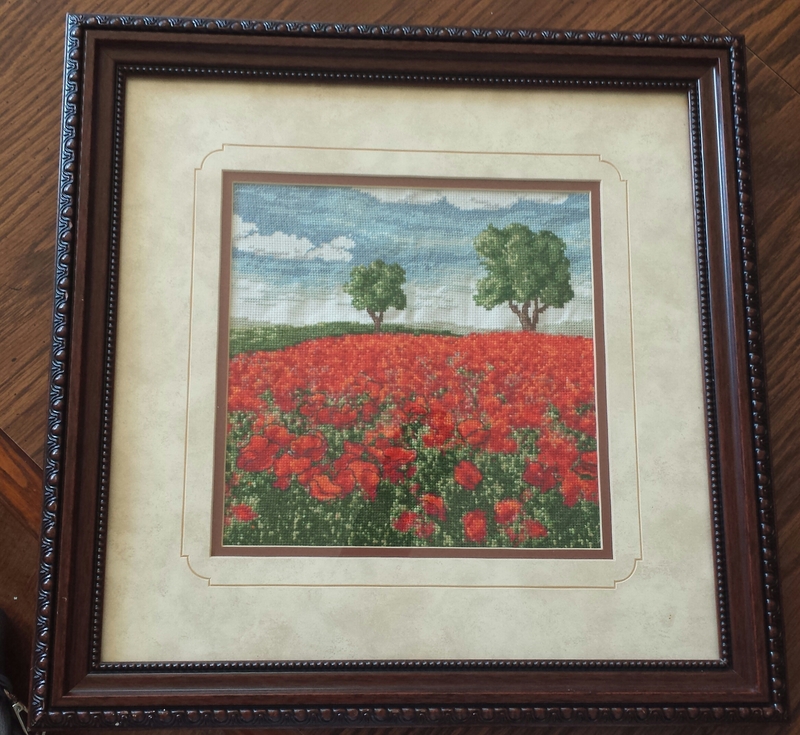 That frame is perfect for your poppies too! A possible finish next time would be great. You certainly seem motivated to get it done now. Looking fabulous so far. Mr Salvador looks very proud and you´d be too!!!! Love your Poppies too’ but Mr S is so smart and so nearly done – you will probably have finished by the time you read this lol.